Miraculously dinner was in the oven, where it would stay for the next 25 minutes. With a little time on my hands I thought I’d be generous and give my “love language of quality time” son some one-on-one attention. (Lately I haven’t been in a sit-down-on-the-floor-and-play-with-the-boys kinda mood. Like Quade commented the other day, “Mommy’s busy doing stuff”. You know the “stuff”. Picking up random Legos, kinda stuff. And wiping lots of bottoms, kinda stuff. And feeding lots of people all-day-long. kinda stuff. I stood stunned. Had we already reached the parent rejection age? At 6? Is this really the moment he no longer needs me? (ridiculous thought, I know. Fortunately, Ann, with her oldest headed off to college says I’ll never stop being needed). Even though I should have just moved on, I couldn’t. His words stung. I’d been under the assumption that the reason we hadn’t played together was because of my busyness, not because of his lack of interest. Whoa. Mommy, I’m sorry I hurt your feelings. I didn’t know you wanted to play with me. I thought I was in trouble. Ouch. Those words hurt worse. I’d sensed that our days were full of more correction than encouragement. I had become tired of the potty talk and fighting and harsh words. But I didn’t know how to fix things other than constantly remind them and give out consequences. The fact my son thought he was in trouble when I asked him to play? Not good. A couple days later I got a new book in the mail. I already love lots of books written by this author’s wife, but hadn’t read any of his. From what I’ve read so far in this book, I’m a new super fan of Clay Clarkson (husband of Sally Clarkson) and his book “Heartfelt Discipline: Following God’s Path of Life to the Heart of your Child” (click on the book image below to be taken to Amazon…affiliate link). When a book changes your insides and effects your “living out”only after a few chapters…that’s a good book. Let’s say there are two kinds of parents: those who watch over what comes out of their child’s heart and mind, and those who watch over what goes into their child’s heart and mind. Parents in the first group are vigilant to restrain their child’s sin ( what comes out of the child’s heart). They carefully watch over their child’s words and actions so as to catch the sin as soon as it appears. When the child sins or does wrong, there is an immediate and usually negative response from the parents. Given my high sense of justice (read more on that here) and my preference for individual sports vs team sports, it makes sense that I struggle being my child’s advocate and instead become an adversary or the “sin police”. For the few days after reading this section I struggled with working towards advocacy. Should I never correct them when they make a mistake? I thought I am supposed to be training and helping them learn how to behave. Right? But I was using that as an excuse to continue my police role. Clay gives great imagery of discipline in his book–keeping your children on the path of life. When they make mistakes or sin gently guide them back to the path. Isn’t that what I’d written about in my “horse post”? The reality is it’s harder to be an advocate. It’s challenging in the heat of a disciplinary moment to stop and consider how to benefit and disciple my son, long term. To think about whether the infraction was deliberate or inconvenient, takes time and patience. So much easier to quickly say, “Stop” or “Watts!” or “Don’t hit your brother!”. I’m only just beginning his book and already I see changes in how I approach discipline in our home (by the way, Clay didn’t pay me to mention or review “Heartfelt Discipline”). I wanted to share what I’m learning and pray it would help you as you mother your little ones. 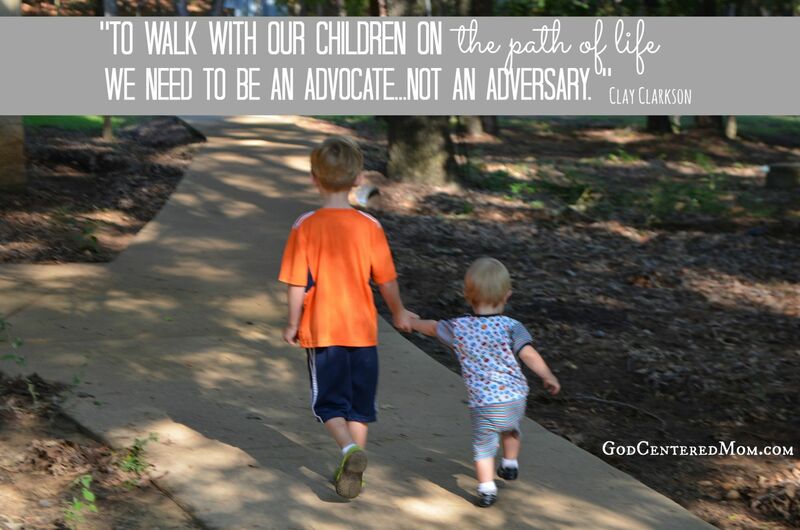 Choosing to be an advocate instead of an adversary. Do you struggle with being the “sin police” around your kids? If you don’t, help the rest of us…what tips do you have for being an advocate instead of an adversary? Have the book and read half, then life interrupted. Good reminder to get back in it! Whoa! So hit mr between the eyes. Thank you. Time to get this book too! I am definitely employed by the sin police. I am quick to correct my children when they use unkind words to one another or grab toys away. Sounds like I need to take a look at this book to see what alternatives I have. I have been looking for a way out of this role because I haven’t seen improvement in my children’s relationships and also my relationship with each of my children is not where I want them to be. I don’t want to be their adversary. It’s so hard to break the habit. I’m really having a hard time stopping my police role. Feels so counter-intuitive to my personality to let offenses go. I am trying my hardest to focus on what’s going in. So I’m distracted in that process and don’t obsess over what’s coming out. It’s all part of the becoming like Christ process. Stripping away my idol of man’s approval. A good, yet painful process. I’m so thankful God used it to minister to you! blessings. Looking forward to have my own little ones someday. But I know there will come a time that it’s hard to take care of them and just be there for them as a mother. This is really a great stuff! Thanks for sharing! God bless..